Whenever we’ve come to Japan on business trips for Otakon, my male collegues would usually lose a little weight from all of the walking around. On the other hand, I would usually put on a couple pounds, from all of the lovely sweets and cakes available in abundance. Even the ones from the local combini are usually surprisingly high quality and delicious! They’re cheap too–a fancy cake shop might run you as much as ￥500 a slice, but the convenince store treats are rarely more than ￥300. Some of them are even as low as ￥100 for amazingly yummy stuff! When we first got here this time I realized that they were easy enough to come by, and as we had so much time I didn’t need to eat every cakey ever. Then I realized that as quick as they appear, they’re gone again. If I see something I like, I should get it or I risk missing it all together. These are the special Valentine’s Day treats that just came in last week at the Lawson’s around the corner from us. Their roll cakes in general are excellent, and these are even a cut above the rest. The cake has a lovely chewy texture, and a very real strawberry flavor with noticeable strawberry chunks in the cake itself. Perfect whipped cream center and a nice fresh strawberry in the middle. Beautiful and delicious. It’s only a couple bucks too–you can’t beat it! So, yeah–here comes that couple pounds, but it’ll be worth it. Sooooooo yummy! What do you think? Does it look tasty? Are there cakes like this at the local convenience store in your area? I love Japanese combinis! This entry was posted in Food! and tagged cake, cakey, combini, cream, delicious, dessert, Lawson's, strawberry, sweet, tasty. Bookmark the permalink. 4 Responses to Strawberry ケーキ! Did you see shirushiru mishiru sunday on asahi tv the other day? (err, that would have been sunday then). 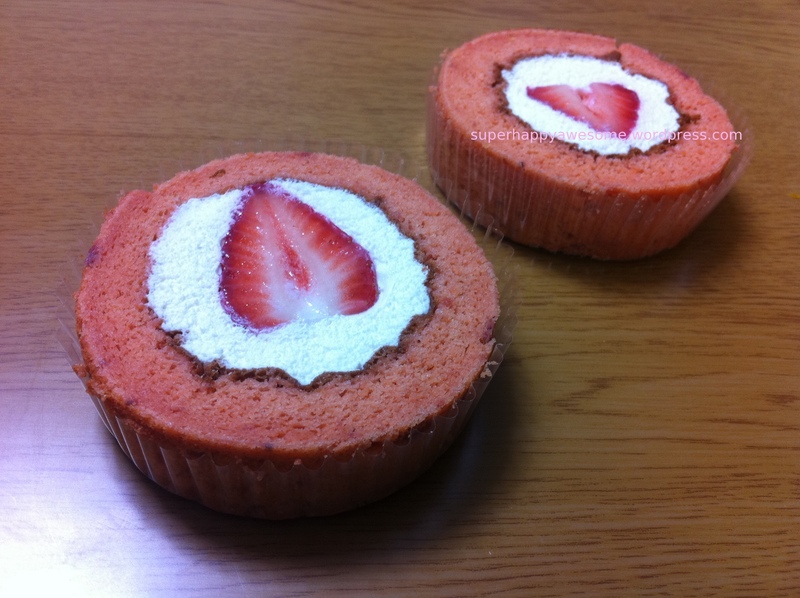 They showed how they make lots of the lawson uchi cafe sweets including the normal roll cake. I love those programmes as they show the inner workings of various food companies – shows how crazy and mechanised the whole process is! Mailed on February 1, 2011 combined Chinese New Year (of the Rabbit) Valentine’s Day Card, and small gift. Slogged through snow, kindly able to follow snow-blowers into and out of town. My street has become the local snowboarding site for those young enough to enjoy falling down. I hope you can acknowledge receipt of card and follow-up on how to order a 6-month subscription to KawaiiBox!! At present I am trying to reschedule tomorrow and Thursday due to blizzards of this week.